I love parties. And having two kids of our own, my husband and I have hosted our share of birthday parties (including, most recently, a "coming-of-age" Bat Mitzvah celebration for our daughter). While we’ve been generous and creative with our choices of entertainment and food for these events, I’ve been very ambivalent about the practice of handing out goody bags at the end. For starters, there's the issue of waste. In most goody bags, the contents are typically inexpensive, imported plastic tchotchkes that tend to break or be forgotten within five minutes of their receipt. These cheap trinkets impose a host of environmental costs, from their production and export to their limited biodegradability. I figure that millions upon millions of discarded goody bags are added to our bloated landfills every year. But beyond the waste, there's the unhealthy message of entitlement that we're teaching our children each time they are handed a goody bag. Think about it: after our party guests have been entertained and fed, we then feel the need to send them home with gifts, as if we haven’t already done enough for them. Following repeated exposure to this practice, I began worrying that my children would turn into little reward addicts who couldn’t leave a party without feeling like they’d earned a prize or gift, simply for showing up. In truth, my kids have enough "stuff" as it is, and they certainly don't need to leave their friends' parties with more "gifts" after they had just given gifts to the birthday child. Besides being wasteful, this is counterintuitive: it wasn’t even my kid's birthday, after all! I feared that this mindless practice would eventually fuel materialistic expectations of gift receiving at the conclusion of just about, well, anything. The good news is that it’s possible to stop doling out goody bags without compromising the celebratory aspect of birthday parties. That’s because of their timing: since goody bags only come out after the party is already over, they clearly aren’t part of the celebration itself. By choosing not to hand them out, we aren’t skimping on the entertainment or the food—the essential components of a party. We’re only streamlining the farewell routine. When the time came for us, as new parents, to throw our first birthday party, we were too worried to go goody bag-less—afraid that we’d face a revolt of crestfallen children who’d declare our celebration to be "the worst party ever." So I purchased goody bag contents within certain self-imposed limits, focusing on items that were either domestically made (this was harder than it sounds) or useful (cue the arts and crafts projects). "We were too worried to go goody bag-less—afraid that we’d face a revolt of crestfallen children who’d declare our celebration to be 'the worst party ever.'" In time, we transitioned from goody bags with assorted junk to handing out a single item. A few years ago, it was adorable bars of bath soap; more recently, baseball cards. One year, the party activity—jewelry beading—resulted in the take-home gift. Eventually, we took the plunge and quit handing out goody bags altogether, discovering to our relief that the party guests managed just fine. For our daughter’s recent Bat Mitzvah celebration, we had to face the goody bag question (or, more accurately, the "swag bag" question) all over again. This time around, we felt the pressure to deliver. That’s because the Jewish Bat (or Bar) Mitzvah celebration, while originating from humble religious roots, has since devolved into big business for party planners as parents seek ever-splashier party themes, coordinated decor—and memorable, over-the-top gift bags for the guests. Bat mitzvah guests making necklaces and bracelets for themselves and family members. We wanted to be mindful of proportionality as we planned all aspects of our daughter’s celebration, including the question of gift bags. After carefully pondering the true meaning of this life-cycle event, we decided that the magnitude of our celebration would hew close to its modest origins. In doing so, we saw no possible purpose for giving away swag bags. Since there is no religious requirement to send celebrants home with anything, we were free to tinker with, or even eliminate, this expensive aspect of the celebration. In striving to be true to our values but mindful of guests’ expectations, we found it helpful to consider the difference between giveaways that are part of the celebration, thereby enhancing its meaning and joy, and giveaways that come at the conclusion of the party, much like goody bags. One traditional souvenir that is distributed before the religious ceremony is a head covering called a yarmulke, which is crocheted or made of satin or leather and embossed inside with the name of the honoree and the event date. The problem is that these are often ordered in abundance, only to be tossed once the party was over. 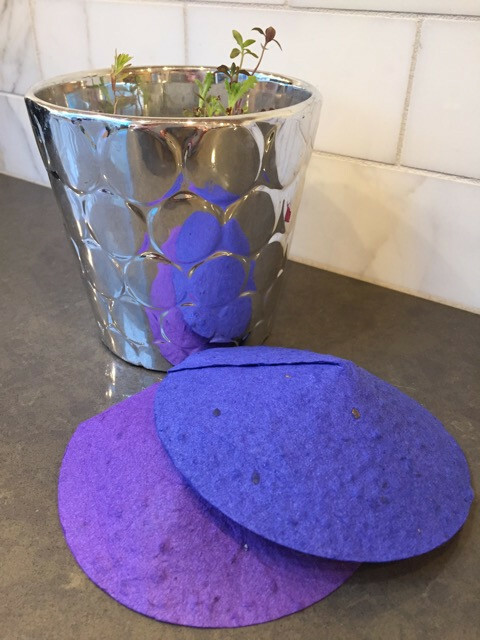 So we stole an idea from our friends Sandy and Ted, who at their daughter’s celebration handed out yarmulkes made of seeded paper, which could be planted or recycled when their usefulness was over. We ordered a scant number (knowing most guests would arrive wearing their own), and planted the few leftovers. 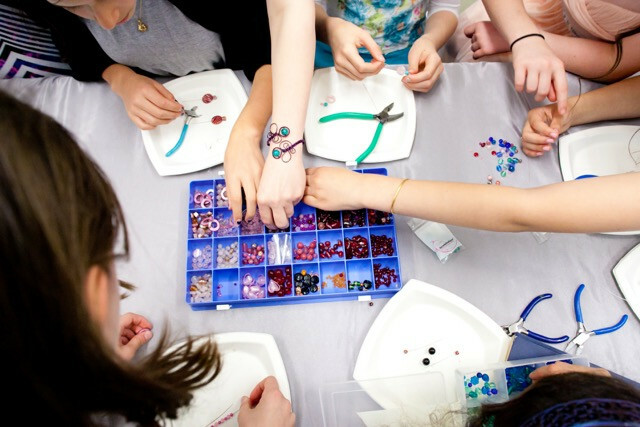 Considering that our celebration took place in an arts school, not a synagogue, we used the venue to our advantage by hiring one of the art teachers to lead the kids in beading and metal stamping after lunch. The activity was a hit, with girls and boys excitedly making necklaces and bracelets for themselves and family members. In this way, our entertainment for the kids included a built-in souvenir—much like our daughter’s beading birthday party many years before. We did decide, in the end, to send guests home with one small gift, but we justified it because it was embedded with a good deed. We made a lump sum contribution in honor of our guests to a local nonprofit that provides pastry arts vocational training to special needs young adults. 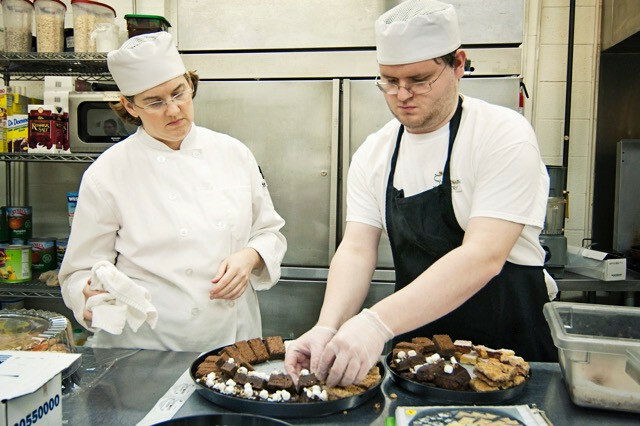 In addition to the donation, we also paid for small cookie favors, baked by these trainees, for guests to take home. Our daughter wrote a note that accompanied each bag of cookies, to thank our guests for their friendship. "We did decide, in the end, to send guests home with one small gift, but we justified it because it was embedded with a good deed." The author's daughter gave out small cookie favors baked at a local nonprofit that provides pastry arts vocational training to special needs young adults. That was it. The sendoff of gifts was minimal, but that was OK. The guests were grateful for the donation and the cookies. And in doing so, we respected our personal values in minimizing waste from unneeded stuff, particularly in a community of family and friends who are blessed to have enough. We’d like to think that we successfully demonstrated that a Bat Mitzvah celebration (or any party, really) can be fun and meaningful in ways that don’t encourage excessive consumerism—and that if giveaways feel necessary, they should be part of the celebration and, whenever possible, done mindfully. I believe we can all pursue a more thoughtful and considered approach to religious celebrations, and we can mark our children’s milestones—whether at a birthday party or a life-cycle event—with a nod to material restraint. What truly makes a party memorable is that the child of honor feels loved and cherished, and that’s because she's surrounded by family and friends—not a mound of stuff. Rinny Yourman lives and writes in the Washington, D.C. area.